SUZUKI is set to enter the small-capacity sports bike market with a GSX-R250R, according to one of Japan’s more reliable motorcycle news sources. 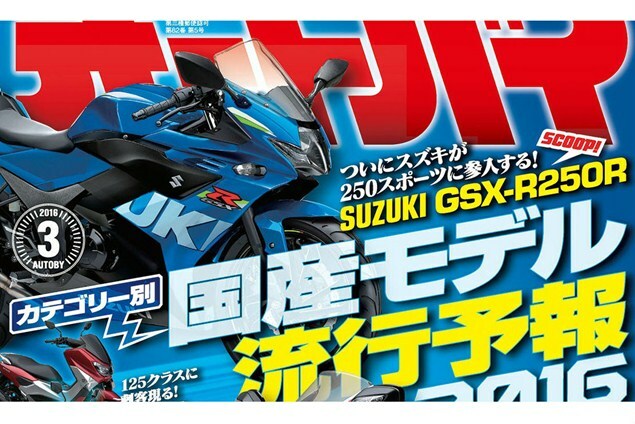 The front cover of the latest issue of Auto-By magazine shows a mocked-up image of the GSX-R250R that it believes is on the way. To keep up with its rivals, Suzuki is likely to use a twin-cylinder engine. Some less-than-reliable websites have claimed it will be a four-cylinder, backing up their speculation with spurious patent drawings that, on closer inspection, actually relate to Suzuki’s GSX-RR MotoGP bike. In reality, while there was a small but valuable market for pricy four-cylinder 250s back in the 1980s, it stemmed from tax and licence laws in Japan, as did the market for exotic 400s. Many UK riders came to love the small fours but that was almost entirely thanks to cheap, second-hand imports from Japan. When offered new here, the four-cylinder 400s met limited success as they cost as much as larger, faster 600cc machines. The tiny 250cc fours made even less sense here than the 400s, so were never offered as new models. The new spate of single and twin-cylinder 250cc sports bikes is being largely fed by demand in Asia and India, and again the capacity has tax implications in some countries. For Europe, the bikes are increasingly getting capacity hikes – witness the Yamaha R3, Kawasaki Ninja 300 and Honda CBR300R – as buyers aren’t swayed by the 250cc category. Should the GSX-R250R turn out to be a real project, and its inclusion in the reputable Auto-By magazine suggests it may well be, we’d expect any Euro version to come later and to gain a few more ccs to match its rivals.